Former Texas Democrat Senate candidate Beto O’Rourke is struggling just days after he launched his 2020 presidential campaign. On the campaign trail, O’Rourke joked about being a mostly absent parent and his comment didn’t play well on social media. Following the social media backlash, O’Rourke apologized saying he was not going to repeat the statement about the role his wife plays in raising their children. Beto tells a coffee shop crowd that he just talked with his wife, Amy. “She is raising, sometimes with my help,” their three kids. Then says he’s running for president for his kids, and theirs. 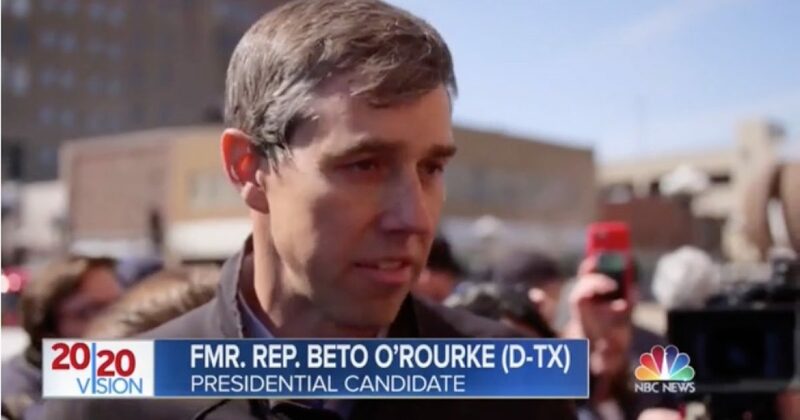 Responding to host Chuck Todd’s question about whether he feels being a white male candidate in the Democrat field is a disadvantage, O’Rourke responded by stating he has “had privileges” and “had advantages” because he is white. O’Rourke’s past record is also going to be a challenge for him going forward. House Speaker Nancy Pelosi (D-CA) wasn’t able to list O’Rourke’s achievements when he served in the House of Representatives for a Texas district. The Washington Free Beacon reported Pelosi couldn’t name a “signature accomplishment” made by O’Rourke during a media press briefing. Meanwhile, President Trump has O’Rourke on his radar. The president noted O’Rourke’s weird hand and arm motions when he talks. O’Rourke raised a lot of money when he ran against Senator Ted Cruz (R-TX) and came close to beating him. However, O’Rourke running in a crowded field of Democrats is going to be much harder than his past political races.